The Triple M series of MG’s all belong to a family of models that commenced with the 1929 MG Midget and continued through to the mid-thirties via a long string of four and six cylinder OHC engined cars that forged the marques identity. 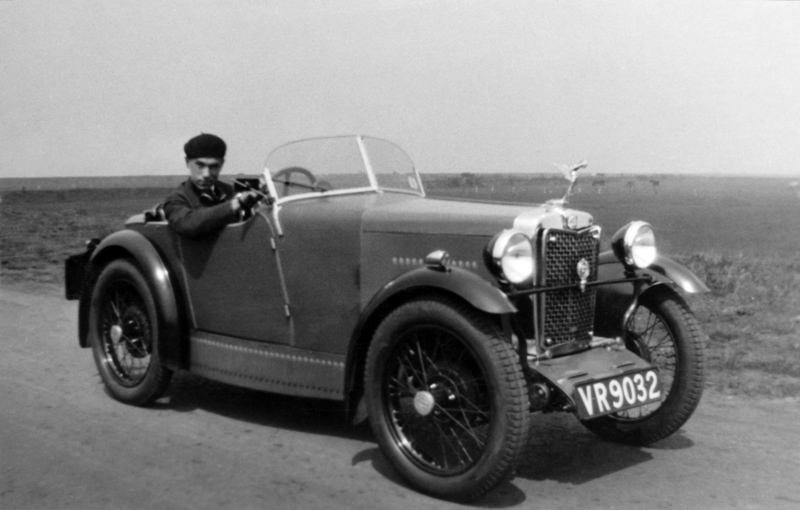 1930 MG Midget VR 9032 was first registered in Manchester in 1930. However, establishing just when this photograph was taken is not quite so easy to ascertain. A good bet is the thirties decade, in that the car looks to be in excellent condition and in particular, the Dunlop three stud tyres appear to be almost new. What can be seen of the driver’s clothing doesn’t provide much assistance although the beret is a very sensible choice of headgear, fashionable at that time and which will at least remain on if caught in the car’s slipstream, unlike a peaked cap. The tax disc informs that the photo was taken prior to 1959 when a major design change to that document took place (http://www.britishtaxdiscs.co.uk/tax-disc-history.php) although the rear view mirror appears to be a motorcycle type of a type popular during the fifties and early sixties.